Some Julia Set timings - all rendered within UF at the same (high) detail settings with shadowcasting and all at the same magnification. In all cases the "entire" Julia was in view (all renders 1024 wide) and the seed was (-0.05, 0.8, 0.1). Basically this just backs up the results for the Mandelbrots. In the case of the Julias the trig and non-trig versions were all visually identical. Wow, I did not realize that the non­trigonometric formulas were so much faster. Here are some higher order formulas that I found with Mathematica. Hopefully, these formulas will provide huge time savings, especially for the popular 8th order version. One nice thing about the odd powers is that they do not require any square roots, so they should be quite fast. These formulas are a bit lengthy, but they checked out correctly on my computer. For optimum efficiency, you will probably need to declare some intermediate variables to avoid redundant calculations. Another deep zoom on the power 8 Mandelbrot. Magnification 4E15, so a million-billion times. Anyway, I guess we are all convinced now that this thing is fractal, and quite uniform, so at whatever magnification we see more or less the same thing. 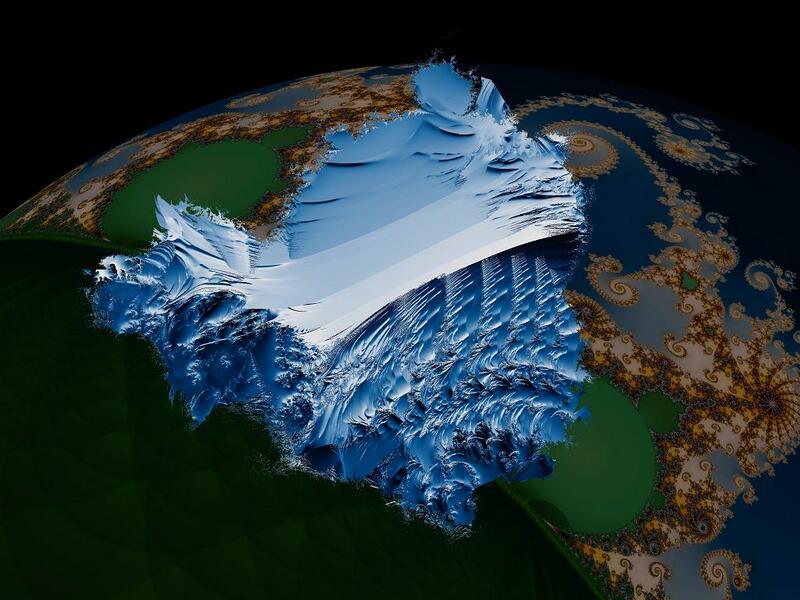 Awesome work with the Mandelbulb! I've been wondering for a little while about another possible way of generating a 3D Mandelbrot and would appreciate your thoughts. you stop whenever the modulus of z becomes greater than 2. Then take the set of pairs (z,w) for which this process never terminates (of course, in reality you put an upper limit, say, 1000 iterations). As a pair of complex numbers has 4 real components, the set is 4 dimensional. This is the full Mandelbrot set. and what I was wondering is: What would it look like to take the intersection of the set in 4-space described above with the unit 3-Sphere and stereographically project down to 3D ? Then do the iteration to see if it is in the set. Has this been done before ? Do you think the results would be interesting ? How would you recommend getting started? The UPR has quick example z^2+c quaternion renders - one solid on Analytical DE threshold and one on point trapping - note that pickover stalks do not produce good results on quaternions, try the other fractal types for those. Again unzip, copy all the text and paste into an open UF fractal window. This time the UPR is an example render of Pickover stalks (orbit trap) - note that "auto distances" is disabled and the solid threshold is much larger than used for solid on iteration/distance estimate. Several more options in the formula plus some bugfixes in the analytical distance estimate methods. r, zj and cj all real. @mpwr real, though using complex is possible with this form. In case anyone isn't familiar flip(zj) simply produces i*zj i.e. makes zj imaginary. It'd be interesting if someone can work out how to apply a full 3D "power"
Render time was about 15 minutes (512 ambient occlusion rays, one shadow ray, two light sources, 2x2 antialias at 1280x720). The raymarcher is very rudimentary, the step size is constant, no distance estimation computations to speed the marching. Not yet. The surface normal (if such a thing exists for fractals) is computed by the central differences method, it's not analytic. Since a couple of years ago I did a demo with a quaternion 4d julia set in realtime with ambient occlusion in the GPU (Kindernoiser: http://iquilezles.org/prods/#kindernoiser), I decided to port this little raymarcher of this morning to the GPU this afternoon. Results are promising, I get almost realtime rendering (5 frames per second) without the distance estimation optimization and some non-raytrace-based ambient occlusion. My motivation to try this has been one of those green-broccoli zooms posted by Twenbie, it so much looks like real vegetation or a forest, it's amazing. I hope I can work a bit next days again and do something like that, I will continue to do so. Also, I think twenbie or somebody with a good raytracer handy should try some subsurface-scattering (translucent surfaces), that should rock quite a lot!!! About the topic, it's really a pity the thing doesn't work that nicely for exponent=2, otherwise I would say this would have been the definite 3D M-Set. In any case, the choice of multiplying both angles by the exponent in the trigonometric multiplication is rather arbitrary I think. It's a pity. I somehow feel the real thing not trigonometric, but polynomial, although I'm not the one to tell. My best attempt so far was this http://iquilezles.org/www/articles/experimental3djulia/experimental3djulia.htm whici is completely ridiculous compared to the beautiful images produced by this trigonometric variation discussed in the thread. Very impressive image for a first post here! My best attempt so far was this http://iquilezles.org/www/articles/experimental3djulia/experimental3djulia.htm whici is completely ridiculous compared to the beautiful images produced by this trigonometric variation discussed in the thread. hi (again!) iñigo, good to see you see you here the render you posted is great! 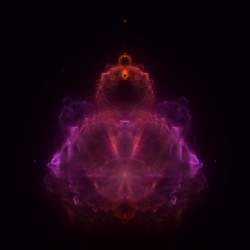 The Mandelbrot of this series doesn't looks good but I have tested it on many other julia equations (such as the phoenix and the newton fractal) and it looks interesting. It is very nice to see new person in FractalForums. I saw your renderings and they looks very interesting. You have very strange iteration formula. It looks like z^2+c formula but with additional rotation by 90 degrees after each iteration. The results are awesome because there are visible lots of beautiful spirals. I have some feedback to share.